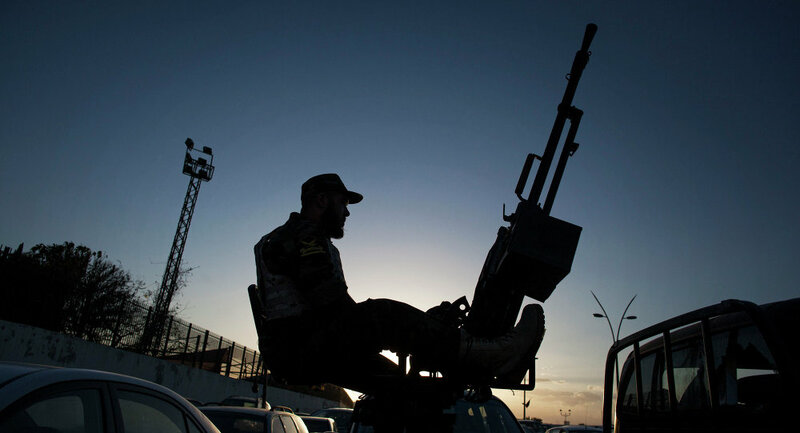 On Sunday, the Libyan National Army (LNA) commenced an aerial bombardment of the Libyan capital Tripoli, a top Libyan military source told Sputnik. Control over Libya remains divided following years of conflict after a NATO-supported rebellion resulted in the murder of its former head of state, Muammar Gaddafi. Since then, there has been no single central government in Libya despite negotiations that both sides have recently held. MOSCOW (Sputnik) - US Secretary of State Mike Pompeo said in a press statement on Monday that the United States requires the Libyan National Army loyal to Gen. Khalifa Haftar to stop its offensive on Tripoli. "This campaign supports the organisation of the national conference," official LNA representative Akhmed al-Mismari said during a press conference in Benghazi. Fayez Sarraj, the UN-backed head of Libya's Government of National Accord, on Sunday met with the chief military prosecutor to discuss a probe into those involved in the offensive on capital Tripoli. "The meeting... dealt with a probe into all those involved in the attack on several Libyan cities... They also discussed the monitoring and documentation of crimes... and human rights violations," the statement read. Libyan conflicting sides have refused to follow the UN request to organize a two-hour ceasefire for evacuation of those injured during the armed clashes in Tripoli, a spokesman for the local ambulance service Osama Ali told Sputnik. "The conflicting sides did not adhere to the humanitarian pause requested by the United Nations," Ali said. MOSCOW (Sputnik) - Some districts in southern Tripoli were left without electricity as a result of armed clashes between the Libyan National Army (LNA), led by Field Marshal Khalifa Haftar and forces loyal to UN-backed Government of National Accord (GNA), led by Fayez Sarraj, Al Arabiya broadcaster reported, citing its sources. — Glenn Greenwald (@ggreenwald) 7 апреля 2019 г. At least 21 died and 27 were injured in Tripoli amid clashes involving Libya's National Army (LNA) and troops loyal to the Libyan Government of National Accord (GNA), the GNA's Health Ministry said in a statement on Sunday. "According to the central operations command of the health ministry of the Government of National Accord ... 21 people were killed and 27 wounded," the statement on the ministry's Facebook page read. The health authority did not specify whether the casualties were among the military or civilians. The announcement comes hours after the UN mission in Libya demanded a 2-hour pause in fighting to evacuate the wounded from the capital's southern suburbs. — Abdulkader Assad (@Abd0Assad) 7 апреля 2019 г. The Libyan Government of National Accord has demanded the arrest of Libya's National Army commander Field Marshal Khalifa Haftar, al-Arabiya reported on Sunday. — CNW (@ConflictsW) 7 апреля 2019 г.
CAIRO (Sputnik) - A spokesman for the army loyal to Libya's Government of National Accord based in Tripoli announced on Sunday a counteroffensive against the advancing troops of Field Marshal Khalifa Haftar. The North African country has been gripped by unrest since its longtime leader, Muammar Gaddafi, was overthrown and killed in 2011. It has been split up between the two administrations in the east and west. Haftar, who is backed by the Tobruk-based parliament in the east, ordered his troops on Thursday to wrestle the capital from what he called terrorist forces. The situation in Libya has been tense since 4 April, when the Libyan National Army, led by Khalifa Haftar, started an offensive to rid Tripoli of militants. On their way to Tripoli, the LNA captured a number of settlements, while the GNA's prime minister ordered the troops to use force if necessary. The United States Africa Command has relocated a military unit from Libya as Libyan commander Khalifa Haftar carries on his offensive against militia forces in Tripoli, according to The National.